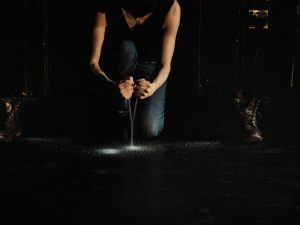 Tyranny Songs is a performance with soundscape and movement that explores the effects of overt and subtle tyrannies and their disguised deployments of power on individual voices and bodies. Drawing on Hannah Arendt’s The Origins Of Totalitarianism, among other texts, I created a soundscape using bird calls and songs (to the untrained ear one cannot tell the difference- a metaphor for the current proliferation of misinformation), quotes, and personal reflection. The actions that accompany it perform resistance, affect, and internalised conflict. This project was developed during an artist residency at HUB14 in Toronto in April 2018. My attendance was made possible by the Winnipeg Arts Council and Manitoba Arts Council. The work was first performed at Art Holm (curated by Hilary Crist & Alexandra Elliot) in Winnipeg from 11-13 May 2018. There are certain phrases that repeat in my head. Warnings, one might call them. Like the chattering of sparrows, sometimes I notice them more than at other times. Sometimes they sound like warnings, sometimes like songs. And although I try to live in a way that lessens the bombardment of messages from corporations that endlessly arc the air around me like arrows from thousands of medieval longbows. And although I try to live in a way that allows me to be struck by the arrows from the defending longbows of resistance and criticality that are less but still many. There is still the ‘although’. There is still the although.